Over all, the side effects have not been unbearable. It is definitely harder to open jars now, and my knees hurt when I'm bending down; but, over all, the side effects have not been unbearable, and I am giving thanks with a GRATEFUL heart. Thank you for your thoughts and prayers for me. NOTE: The plaque above was given to me by my sister-in-law. At the time she bought it, she didn't realize how well it was going to coincide with my theme of GRATEFULNESS for this year, but God knew about it in advance. 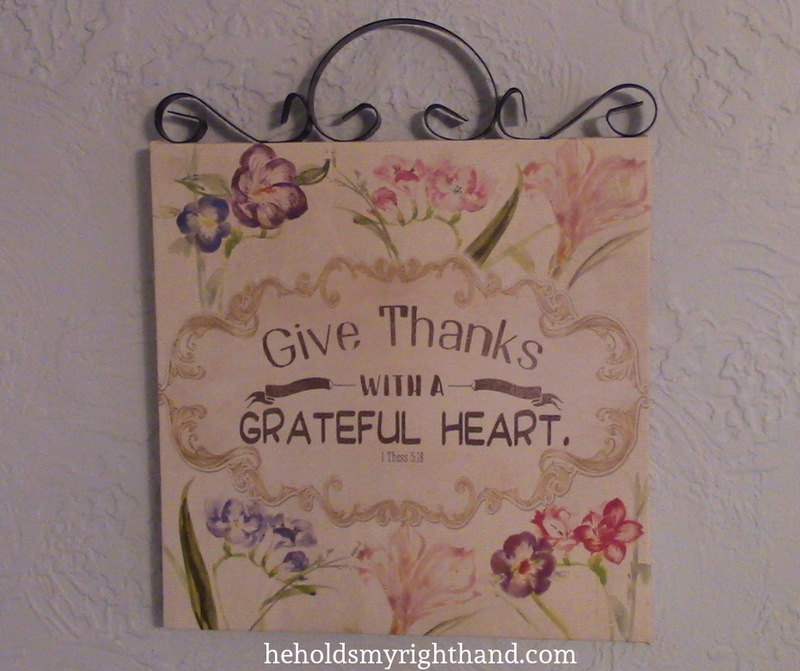 It is hanging on the wall in my kitchen to help remind me daily to give thanks and be GRATEFUL in all circumstances. Thanks for the update, Vicky. You're a courageous, faithful battler as you endure this process. I'm sure God is looking down adoringly at you for your grateful heart. Big hugs to you. you are a beautiful example to others- especially with your gratefulness.Thank you for sharing.Praying for you.